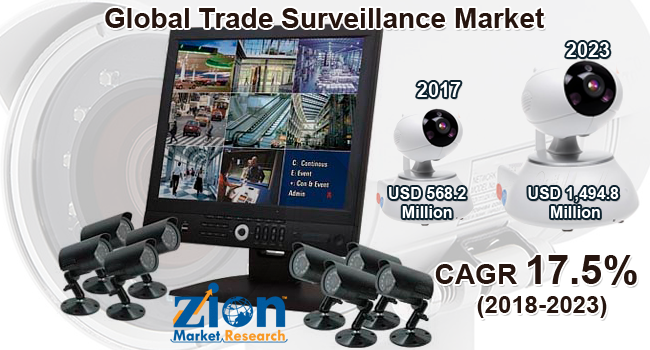 With the presence of a large pool of participants, the Global trade surveillance market is displaying a highly competitive business landscape, finds a new research report by Zion Market Research (ZMR). CRISIL Ltd, Software AG, NASDAQ, FIS, Cinnober, SIA S.P.A., B-Next, IPC, and Aquis Technologies are some of the key vendors of trade surveillance across the world. These players across trade surveillance market are focusing aggressively on innovation, as well as on including advanced technologies in their existing products. Over the coming years, they are also expected to take up partnerships and mergers and acquisitions as their key strategy for business development, states the trade surveillance market study. Citing an instance, in August 2018, Statkraft—a hydropower firm and largest renewable energy generator of Europe—selected NASDAQ’s SMARTS Trade Surveillance for Energy System for monitoring trading behavior pattern across the energy markets in the European Union as well as Norway in accordance with Market Abuse Regulation. As estimated in this report, the global trade surveillance market stood at US$ 568.2 Million in 2017. Witnessing a tremendous rise during the period from 2018 to 2023, the trade surveillance market is expected to procure revenue of US$ 1,494.8 million by the end of the forecast period. The main component types available in this trade surveillance market are solutions and services. Among them, the demand for services is relatively higher and the trend is anticipated to remain so over the next few years, notes the research report. “Trade surveillance market is gaining traction across the globe with requirements for massive security solutions as a result of rising incidences of data manipulation and frauds during financial transactions,” says the author of this study. Apart from this, humungous demand for monitoring of trading activities across financial institutions is likely to provoke the growth of trade surveillance market over the next few years. Analyzing multiple parameters and examining real-time events for fraud detection is highly time consuming and needs complex algorithm, thereby posing a threat to the growth of trade surveillance market. Nevertheless, growing trend of low-latency reporting and time-series database and tremendous requirement for modern & proactive trade surveillance activities is likely to drive the business growth over the coming years. This, in turn, will normalize the impact of hindrances on the trade surveillance market, reports the study. Regionally, North America has been leading the worldwide trade surveillance market and is anticipated to continue on the dominant position in the years to come, states the trade surveillance market study. Immense application of big data analytics in trade surveillance activities is the main factor behind the dominance of the North America trade surveillance market. The high number of market players being headquartered in North America is another significant factor that is supporting this regional trade surveillance market. For the record, North America contributed nearly 45% towards overall trade surveillance market revenue in 2017.